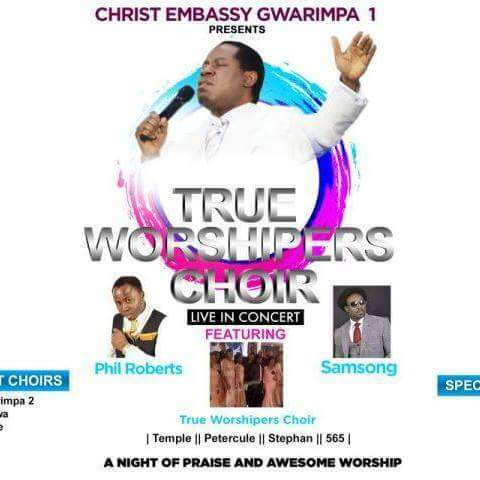 Join us as we count down to an “Evening of Praise & awesome worship” with Phil Roberts & Sam Song with the True Worshippers Choir Live In concert. Next: 2015 Youth and Women Grassroot Awareness Declaration! EFCC Investigates Cryptocurrency Platform over Fraud Allegations! Jumia becomes first African Start up on New York Stock Exchange! Jiji takes over OLX, now in full operation! Uber Acquires Careem, Dubai cab enterprise in a $3.1 Billion Deal! Adeleke, South West PDP bask in the euphoria of judicial victory! Idris Elba Plays #Nigerian DJ In New Netflix Series! CAN CUSTOMER BE CHARGED FOR ELECTRICITY EVEN AFTER DISCONNECTION? #IWD2019: WaterAid, UNICEF Introduce new WASH Guide! Access and Diamond Banks shareholders approve merger! #Cryptocurrency: Investors cry foul as Gerald Cotten’s Cold Wallets Found Empty! Presidential election result: Nigeria Stock market loses big! ActionAid Nigeria Comments on 2019 Presidential Elections, urge elected president to prioritise poverty eradication! (Video) Muhammadu Buhari wins 2019 presidential election! nTel storms market with a bang, but will it fare better? OPPOSITION COALITION RAISES ALARM OVER PLOT TO ASSASSINATE IKENGA! Nigerians call on President Buhari to sign #NOSDRABill to end Oil Spills in Niger Delta! #ThinkElectionThinkPeace: Media Practitioners, CSOs synergise to ensure violence-free 2019 elections in Nigeria! Investors Lose Millions of Dollars as Cryptocurrency Founder Dies With Sole Password! #Bitcoin: Are Nigerian investors feeling safe with Crypto-currency? Facebook sets to Integrate its Messaging Services on WhatsApp, Instagram and Facebook messenger! Forex: CBN pumps $210m into Inter-Bank Market! NBA Summons An Emergency NEC Meeting Over Onoghen’s Suspension! MTN Nigeria to be listed on the Nigerian Stock Exchange this Year! NAF unleashes terror on deadly bandits in Sokoto, despatches fighter jets! “Thousands of Nigerians are being killed in Ghana Prisons”, Nigerian Prisoner cried out! Hollywood honours Taraji P. Henson with a Star on Walk of Fame! Atiku may have not solid plan for Nigerian Tech ecosystem! Abuja New Airport Terminal officially opens! [Video] Haywhy De Ryhmer drops ‘Oriki’ another hit single! #KonstructApp: Delivering Smart Construction Services on the Go! Prof. Sophie Oluwole, an Icon of Yoruba History bids world farewell! Dotunroy.com celebrates esteemed fans, readers in a Christmas message! Breaking: ANTI-DAPO ABIODUN PROTEST RESUMES IN #ABUJA! NESREA kicks off Generator Emissions Control Programme Across Nigeria! Nigeria’s ex-Defence Chief, Alex Badeh shot dead! Groups accuse Ogun APC Guber Candidate, Dapo Abiodun of Forgery, Skipping NYSC, call for his arrest! Access Bank Plc acquires Diamond Bank! World Bank releases $3Million For Vocational Education in Ekiti! What is a Smart TV and Do We Really Need it in Nigeria? Nepotism is an act of corruption, US Embassy says! Google Station Launches Free WiFi in Wuse Market, Abuja! Shanemayox on [Video] Electoral Malpratices: INEC Adhoc Staff Caught on Camera! Bottwowsbip on Strike Update: Labour suspends strike!